never chase a dog as that will only make him run further away from you. I opened a can of dog food and scooped it out of the can and onto the ground. arrived,to my surprise, I saw the same Akita that I had seen at the garage. never fit. Over the next 2 weeks I brought food every day for the Akita. food close to him. He ate it. I tossed the next bite a little bit closer. spoon! I had a slip lead in my hands and I slowly put this over his head. 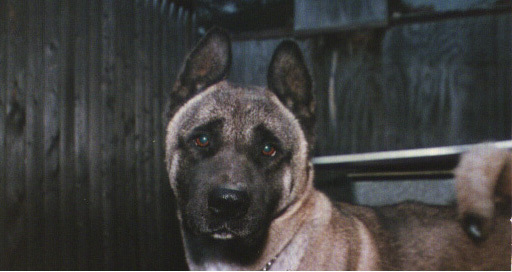 Akita rescue group. I knew that this is a breed that must be placed carefully. a lot of time with this Akita. His temperament seemed to be incredible. He showed no aggression towards people or the other dogs at the shelter. and a male Borzoi,another one of my rescues, but I knew that this could work. positive. I had no choice but to treat him. months of careful feeding, was 115 pounds!! nursing home I visited on a monthly basis. He loved the attention. deeper. I could not wake Abby when I returned home on this day. He had passed on to a better place and is waiting for me over the bridge. joy of owning an Akita had it not been for Abby. I'm just glad I'll never have to know.